Midhurst finally found their league goalscoring touch when they beat Storrington 3-1 at the Rotherfield in SCFL division one. The first clear-cut chance came early on when Scott Dormer’s quick throw-in put Lewis Hamilton in behind Storrington’s defence with only goalkeeper Gary Elliott to beat. His fiercely-driven cross-shot did beat the keeper, but smacked into the far post with the rebound having enough pace to beat the supporting George Morris. But Midhurst did take a deserved lead on 30 minutes, when a long ball was headed on by Dormer to release Hamilton, who confidently struck the ball over Elliott. Morris, who was a constant threat with his supporting runs, had three decent chances before half-time, two of which were saved by Elliott and the third blasted inches over the bar. The second goal did not come until the 65th minute when Hamilton scored his second of the game when he chipped Elliott following an astute pass from Nathan Casselton. 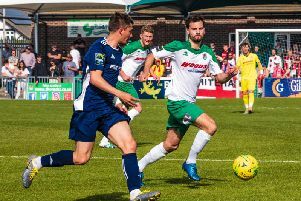 Storrington, with nothing to lose, threw men forward and there was an almighty scramble in front of the Midhurst goal with the away team passionately demanding a penalty, claiming that Morris had handled, but which the referee did not give. Then on 72 minutes the result was effectively sealed when Dormer added a third goal from Hamilton’s pass. Storrington never gave up and were rewarded with a consolation 13 minutes from the end when, despite two good saves by Jeal, the ball ran loose and Shoebridge scored from close range. This was an excellent team performance from the home side and the three points were well deserved. Midhurst: Jeal, Broughton, May, Grantham, Greg Chaplin, Casselton, Martin (Watts 30), Hyde, Morris, Dormer, Hamilton. Unused subs: Sheldrick, Taylor, Tom Chaplin.